The Custom Category is a user defined field that allows you to group work orders with additional information important to your organization. 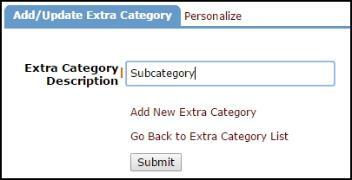 You can define the category label and populate the items in the drop down list. This field is particularly useful if you are already utilizing the other codes (problem type, purpose, project, etc.) on the incident form. The custom category gives you the flexibility to create your own code for your incidents. Click the Update Information button to save. Enter the Custom Category Description. *Note: These will be the items populated in the Custom Category drop down list on the incident form.